Technically speaking I have only sailed twice this summer (ie after the Summer Solstice). When there's a morning northerly brushing the beach at Towd Point (the closest spot to our house) I race down there, rig the 7.5 as fast as I can, and get some runs in. But rigging a 7.5 in a hurry and derigging it in an hour or so is not particularly enjoyable. It's been about a decade since I last did this, but I put padding on the inside of the van's roof rack, and I slide the top of the sail under the front rack while tieing retention lines from the boom to the back rack. I can safely get to Towd Point Beach keeping my speed under 20 mph, so for the last few weeks I've kept the big wing rigged in the barn. Oh yeah. Only caught 45 minutes last weekend, but sans rigging time it was a complete win. Hell it would be a win even with rigging and derigging, but I'd have missed the chance to do something stupid! When I started outfitting my windsurfing van back in 2003 one of the first ideas I poached was the Spencer Bucket. I met Spencer at a Dasher Windsurfing Clinic in May of ’03, and I was immediately drawn to his bucket. “Ya gotta have one,” Spencer explained. "You can throw a good quantity of wet and sandy neoprene, harnesses etc into the thing after a session, you can use it as a platform to change fins and footstraps on a board, and the thing can be hosed out or just whacked on the back to get clean again. The Spencer Bucket*." I’m going to K-Mart right now to replace it. Can’t imagine showing up for a sesh without one. In the four years since I first set up my windsurfing van, I've all but completely switched from standard to RDM masts. While my old mast base extension rack had no trouble accomodating RDM extensions, I decided to make a new rack anyway now that I'm all but completely RDM. While I was at it I decided to fool around and see if I could get my downhaul crank to live in the rack as well. I think I came up with a solution, with both the cup of the crank as well as the handle having holes to accomodate them. ...but he won't spend another 2% to allow him to tune all that precision gear? Gear that's pretty much a waste unless it's dialed in? Check out the Plyrack web page and see how the thing folds up if you need to get it out of the way. I think there is an idea here for van board racks too...swinging arms allow the van to carry oversized objects if needed. With a single sheet of plywood (I'd get 3/4") 4 hinges, some screws and a jig saw you can put this thing together. Cool! "It's good to have a shredmobile" my friend Caldwell said, and now I have one. 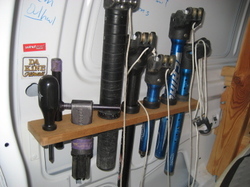 My windsurfing van is a Ford E150 done up with lumber and inexpensive "storage solutions" from k-mart. Check out the van photo album to see and read how I've set it all up. After four years it's quite dialed in. Each photo is accompanied by notes on how it all works...I update these as I make changes and/or learn better techniques. (Thanks to Spennie the Wind Junkie for hardware tips and the story of his very impressive van.) If you're interested in greater detail on any aspect of the van, leave a comment...I'll answer and add photos as necessary. Behind the driver’s seat is the board rack. 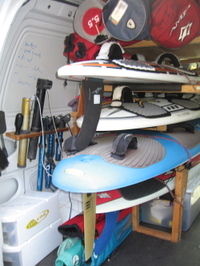 The rack takes four boards, and has a sail loft above which holds my four largest sails. It's made of 2x2's. Supporting crosspieces have foam pipe insulation on them to protect the bottom of the boards. 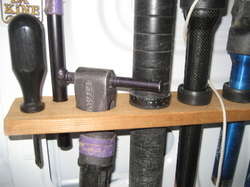 There are eye bolts in the uprights for bungee cords to secure the boards, as well as a bottle opener. If you use bungee cords it's good to anticipate how the thing might snap out at you if the far hook somehow breaks, and position yourself accordingly. An eye surgeon friend has noted that bungee cords do their fair share of putting people's eyes out. In order to fit more boards into less verticle space, three of the boards are spaced so tightly that they must slide out sideways, as there isn’t enough clearance to allow the foot straps to fit underneath the support for the board above it. I’ve got a crude cantilever system that supports the two middle board supports entirely from the single inside rear support. Note that this only applies to the rear rack. The front rack is a straight “ladder” design. The van also sports 9 storage drawers, a mastbase extension rack, and secure boom storage in addition to room for 3 additional sails. There is lots of detail and photographs, in addition to specific information on how it’s all put together, in the Windsurfing Van photo album. I was inspired to share my attempts after years of availing myself of those who have generously documented their windsurfing vehicles online. 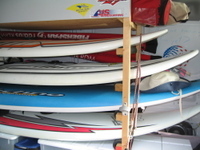 Check out Hans Anderson's old but still good list of windsurfing vehicle links. For an example of someone trying to have it all, take a look at Danny Steyn's Ultimate Windsurfing Van. Check out these steel racks from an English outfitter. In July I adapted my mast extension rack to accomodate a downhaul winch.